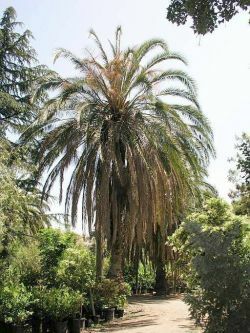 Comments: This hybrid date palm is a cross between the Canary Island and the Cliff Date palm. The genus Phoenix is an "Old World" family of palms. From the Canary Islands in the Atlantic to the Philippines in the Pacific, Phoenix palms are a common sight. They are also genetically closely related and hybridize easily. It is likely that most Phoenix growing in California have a somewhat mixed parentage, and that to get a 'true species' plant, you need to go back to its source in Africa or Asia.